GOD has made a special bond…. And its time for you to tie the knots…!! To walk together & to run..!! Are here today to take some vows..!! 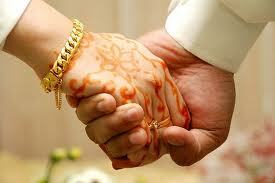 For starting a new journey together..
With GOD giving His special blessings…!! And all the happiness in life…!! A very Happy Married Life..!! This entry was posted in Happiness, Life, Relationships and tagged Akanksha, Akanksha Rastogi, blesings, celebrate, Companion, Epic, experience, family, Fun, God, happiness, Happiness Poem, Journey, Joys, Knots, Life, Lifelong, love, Lyric, Marriage, Married life, Music, People, personal, Poem, Poetry, reflections, Relation, Relationships, romance, Souls, Thoughts, Vows, Weddings by Akanksha. Bookmark the permalink.